The Jaguars lose their third straight conference game and fall into a tie for third. The Sherwood High School boys basketball team was ready to go. 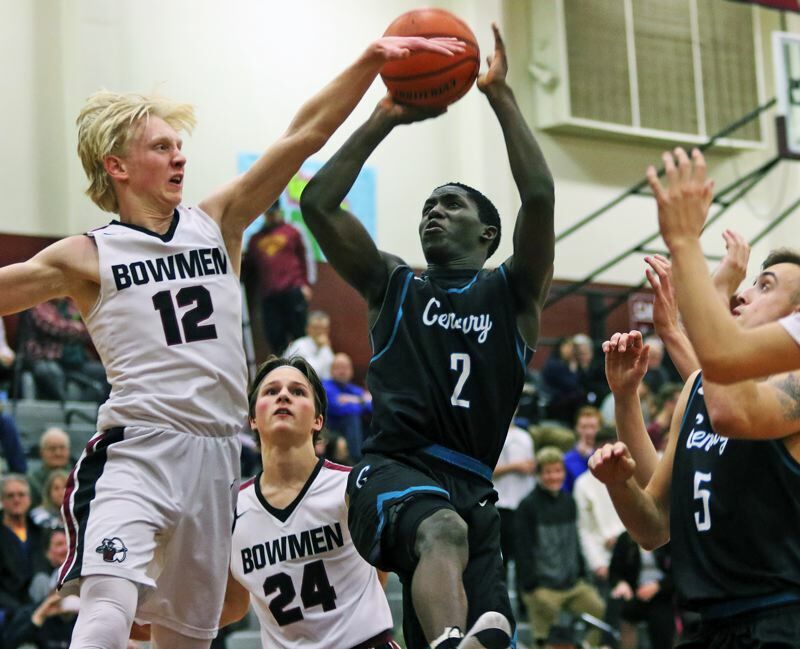 The Bowmen showed it right from the beginning of Wednesday's contest with Century — and they never looked back. Sherwood jumped out to a fast 9-0 lead, upped that to 19-6 at the end of the first quarter, and wasn't even slightly threatened the rest of the way, as it ran to a 70-50 win over the Jaguars in a Pacific Conference game played at Sherwood High School. "It was great. Right from the get-go, we were just getting on them. Everything was falling for us, and we were playing great defense," said Sherwood junior guard Jamison Guerra, who led all scorers with 22 points. "The start just propelled us for the rest of the game. We like taking the lead early, and keeping control the rest of the game." With the win, Sherwood improved to 6-0 in Pacific Conference games (15-4 overall), putting the Bowmen alone in first place in the standings at the midway point of the conference season. Meanwhile, Century moved to 3-3 in conference play after a third consecutive loss (8-10 overall), putting the Jaguars in a tie with Liberty and Newberg for third place in the conference standings. "They're a great ball club," Century junior forward Chance Sparks said of Sherwood. "That's why they're one of the top teams in the league right now." The Bowmen, and Guerra, got off to a flying start to Wednesday's game. Guerra opened the contest by scoring back-to-back baskets on drives to the hoop. Sherwood senior Tyler Hix followed with a 3-point basket, coming off a pass from senior post Charlie Bulfinch, and Guerra then scored on a layup, giving the Bowmen a 9-0 lead with 3 minutes and 42 seconds left to play in the first quarter. 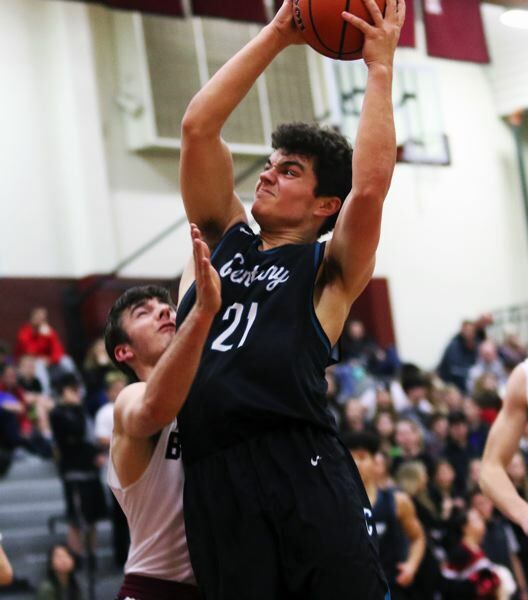 Asher Krauel sank a pair of 3-pointers later in the quarter, and Bowmen senior Braden Thorn ended the period with back-to-back baskets, giving Sherwood a 19-6 advantage heading into the second quarter. Guerra opened the second quarter with back-to-back baskets on drives to the hoop. Bulfinch added a free throw, upping the Bowmen lead to 24-6 with 6:51 remaining before halftime. Century, trying to battle back, got 3-point baskets from junior Ikin Chan, senior Jared Gordon and junior Jospin Mugisha later in the second quarter, making the halftime score 36-18. But Sherwood pulled away again to open the second half. Krauel scored five straight points to start the third quarter. Guerra followed with a steal and layup and Thorn added a basket, giving the Bowmen a 45-18 cushion with 6:14 left in the third. Sparks tried to keep the Jaguars in it, scoring eight points in the period, but Sherwood, with Hix and junior post Blake Jensen adding baskets, would go on to take a 57-31 lead to the fourth quarter. Jensen then opened the final stanza with consecutive baskets, giving the Bowmen their biggest lead of the game, at 61-31, with 7:16 left to play in the contest. Century, still battling, got six points by senior Alex Garcia and 3-point baskets from both sophomore Edy Essien and junior Conner Bingham down the stretch, trimming the final margin to 70-50. "We had a chip on our shoulder the whole game," Krauel said. "We practice hard every day. We all know what to do when we get in the game. This was really fun tonight." While not so fun for the Jags, Sparks, who was quick to congratulate the Bowmen after the game, was equally quick to warn anyone against he and his squad packing-it-in over the regular season's last few weeks. "I don't think we played our game tonight and they definitely jumped us, and that kind of caught us off guard," said Sparks. "But I know we'll never give up, and now on to the next one. That's just the culture here. No matter what the score is, we're going to fight and claw our way. If we come out with a win, awesome, but if not, we'll still have something to hang our hats on." Guerra scored his game-high 22 points on a 10-for-13 shooting night from the field. He also had six steals in the victory. Krauel added 13 points and five rebounds. Jensen scored 10 points. Thorn had eight points and five rebounds. Hix scored nine points. Senior Caden Snelling and senior Ryan Sandilands had three apiece. Sherwood, as a team, made 28 of 61 shots from the field, with 10 3-pointers, and four of 11 free-throw attempts. For the Jaguars, Sparks had five rebounds to go with his 10 points. Mugisha added eight points. Senior Daniel Berger, Gordon and senior Alex Garcia had six apiece. Century, as a team, made 19 of 51 shots from the field, with six 3-pointers, and six of 10 free attempts. Both teams will be back in action on Friday. Sherwood will travel to Newberg and Century will host Liberty in Pacific Conference games starting at 7:15 p.m.